Those who get dental implants enjoy a plethora of unique benefits to their health and well-being. Are you an adult who is wondering what your best treatment option would be for replacing one or more missing teeth? If so, you’ve certainly come to the right place. Our Windsor Locks, CT, general dentist, Dr. Thomas Yanik, prides himself on providing the very best in restorative dentistry to make sure that everyone gets the tooth replacement they want based on their lifestyle, budget, and oral health. So, what are dental implants and how can they help you? We are here to explain! Dental implants are small metal tooth root replacements. That’s’ right; an implant is designed to take the place of your missing tooth’s roots. Even though you don’t see the roots of a tooth, that doesn’t mean they aren’t important. In fact, without the tooth roots your jawbone would deteriorate. This is why it’s so important to replace your missing tooth or teeth, as bone loss is a serious complication of untreated tooth loss. Of course, the only way to truly provide the jawbone with the stimulation it needs is by placing a dental implant into the jawbone, where it will function just like the roots of the teeth. 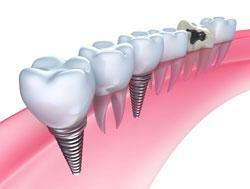 The sooner you get a dental implant after tooth loss the better. Since the jawbone will not deteriorate, this also preserves your facial structure, reducing the chance for sagging, sunken cheeks and premature lines and wrinkles. Having an artificial tooth that both looks and functions just like a real tooth is so very important, and a dental implant is truly the next best thing to a real tooth. No other restoration is like implants. Since they function just like natural teeth and even fuse together with the jawbone to become one, you’ll have your dental implant for the rest of your life (provided you continue visiting our Windsor Locks dentist for routine checkups and you maintain good oral hygiene). Tooth loss can impact everything from the foods you can actually eat to your speech. Significant tooth loss can make it difficult to chew certain foods, which can lead to nutritional deficiencies. Furthermore, tooth loss can lead to speech impediments such as a lisp. The best way to restore speech and to enjoy all of your favorite foods again without worry is to get dental implants. They are strong and durable enough to tackle all of your favorite foods, so get ready to enjoy mealtimes again. Yanik Dental in Windsor Locks, CT, is dedicated to providing you with all the dental care you need to either maintain or improve your oral health. Don’t let tooth loss have the final say when it comes to your oral health. Let us provide you with the restoration you need for a beautiful smile.